The winter weather can pose risks here in Michigan when working outside in the elements. Please make sure you are safe and adhere to precautions during inclement weather. 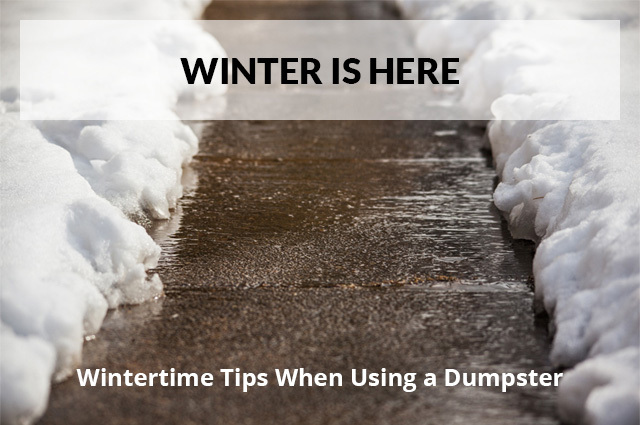 Make sure pathways are clear of ice and snow so you have an unobstructed route to the dumpster to minimize risks of slips and falls. Dress properly for the weather conditions. Exposure to below freezing temperatures for a period of time can cause frostbite. Use work gloves when handling metal in icy weather. Not only is it slippery and hard to grip if icy but can burn your skin. As with shoveling, always lift properly and make sure that you are in heart healthy condition when moving heavy items. Priority Waste hopes these wintertime safety measures help you while using dumpsters. Contact us today for a quote or to reserve your dumpster.